MISRGO provides administrative oversight and program direction for a portion of the 15% Set-A-Side of the tobacco settlement monies from the Arkansas Department of Health Tobacco Prevention and Cessation Program. The goals of MISRGO are to prevent the initiation of tobacco usage among youth; promote cessation among youth and adults; eliminate exposure to second hand smoke; and identify and eliminate disparities related to tobacco use in Arkansas. MISRGO/UAPB and SOS in partnership with Univision Arkansas announced the Grand Prize Winner this past Friday, July 12, on-the-air. Mr. Alejandro Garcia and his family won four tickets to a soccer game in Dallas, Texas this fall; a one night stay in a Dallas hotel; and a $100 gas card. “I’m very happy to have won, and I want to thank the Minority Initiative Sub-Recipient Grant Office for this opportunity,” said Mr. Garcia, Grand Prize winner of the sweepstakes. Mr. Garcia currently smokes and, through the promotion, called the Arkansas Tobacco Quit Line to get help kicking the habit. MISRGO/UAPB and SOS partnered with Univision Arkansas for the promotion to encourage Hispanic men to call the Arkansas Quit Line. The four-week initiative included media, public relations, and social media. 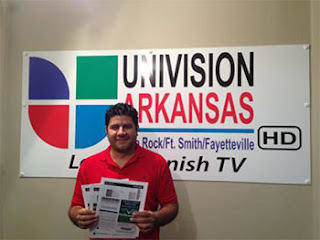 Univision Arkansas’ viewers were offered the chance to win the soccer sweepstakes by calling a designated phone number after which smokers could be directed to the Arkansas Tobacco Quit Line. Over 100 people participated in the sweepstakes. “We are very pleased by the response and increased numbers of calls to the Arkansas Tobacco Quit Line,” said Toni McCastle, Media Liaison for MISRGO. “This is a step in the right direction to rid Arkansas communities of tobacco. For more information about the Minority Initiative Sub-Recipient Grant Office with the University of Arkansas at Pine Bluff or the results of the soccer sweepstakes, contact Toni McCastle at mccastlet@uapb.edu or call 870.575.7722.